You Save: $10.01 (67%) Ships in 1 day. Soft Cover, 422 pages, 5.50 x 8.00. » Also available in a hard cover edition. 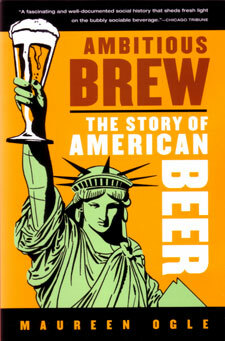 Author and historian Maureen Ogle tells the epic story of American Beer, from the immigrants who invented it to the upstart microbrewers who revived it. Beer might seem as American as baseball, but that has not always been true: Rum and whiskey were the drinks of choice in the 1840s, with only a few breweries making heavy, yeasty English ale. When a wave of German immigrants arrived in the middle of the nineteenth century, they promptly set about re-creating the pleasures of the biergartens they had left behind. CHAPTER TWO "I Must Have Nothing But the Very Best"
CHAPTER THREE "Masters of the Situation"
CHAPTER SIX "You Have to Think About Growth"
LATE SUMMER, 1844. Milwaukee, Wisconsin Territory. Phillip Best elbowed his way along plank walkways jammed with barrels, boxes, pushcarts, and people. He was headed for the canal, or the “Water Power,” as locals called it, a mile-long millrace powered by a tree-trunk-and-gravel dam on the Milwaukee River. Plank docks punctuated its tumbling flow and small manufactories—a few mills, a handful of smithies and wheelwrights, a tannery or two—lined its length. Best was searching for a particular business as he pushed his way past more carts and crates, and dodged horses pulling wagons along the dirt street and laborers shouldering newly hewn planks and bags of freshly milled grain. He had been in the United States only a few weeks, and Milwaukee’s bustle marked a sharp contrast to the drowsy German village where he and his three brothers had worked for their father, Jacob, Sr., a brewer and vintner. Wrong answer. Best possessed what the historian of his brewery later called a “fiery” personality and an irresistible fount of aggressive determination. Best cajoled Langworthy, argued with him, badgered, and perhaps even begged. The metalworker may have been surprised at the passion that poured from the otherwise unassuming man before him, a slender twenty-nine-year-old of medium height, whose prominent ears and blond hair framed deep-set gray eyes and a ruler-straight nose. Overwhelmed and overrun by the man’s persistence, Langworthy finally consented. That obstacle behind him, Best prodded Langworthy to hurdle the next: lack of materials. Milwaukee, frontier town of seven thousand souls, contained only two sheets of metal. Langworthy needed eight or nine plus a bucket of rivets. Left to his own devices, he might have abandoned the commission; with Phillip Best breathing down his neck, that was impossible. Langworthy headed south, first to Racine, then to Kenosha, and finally on to tiny Chicago. It was an exercise in frustration: He could not find enough material for even one section of the boiler. There was nothing for it but to dispatch an order to Buffalo, New York. Eventually the goods arrived, and Langworthy and his employees set to work transforming metal sheets and rivets into an oversized pot. They worked on a nearby dock, where what the metalworker called the “music of riveting”—racket is more like it—drew an enormous crowd. “[A]ll came to see it,” said Langworthy, “and I think if the roll had been called at that time that every man, woman, and child except the invalids, would have answered ‘here.’” The finished product was a squat rotund vat, about four feet in diameter and four feet high, big enough to hold three to four hundred gallons of water. When the boiler was completed, Phillip returned to the ironmonger’s shop, this time lugging a cloth bundle of coins—so many that the two men spent more than an hour tallying the value. The task revealed the truth: Best did not have enough money. He explained that his family had spent nearly all of their funds— two hundred dollars—on a piece of property on Chestnut Street, where they planned to build their brewhouse. Phillip had commissioned the vat in expectation of a forthcoming loan, but the money had failed to materialize. The bundle of coins represented his family’s only remaining cash. Phillip asked Langworthy to keep the boiler until he could scrounge up the balance. What happened next is a credit to A. J. Langworthy’s generosity and Phillip Best’s integrity. Langworthy was but a few years older than Phillip. Like Phillip, he had left the security of the familiar—in his case, New York—for the adventure and gamble of a new life on the frontier. Perhaps he glanced through the door at the mad rush of people and goods flowing past unabated from daylight to dusk. He was no fool; he understood that business out in the territories would always be more fraught with risk than back in the settled east. But what was life for, if not to embrace some of its uncertainty? He eyed the man standing before him. He knew about the family’s decision to sell their winery and brewery and venture to the new world. He had come to understand that Best’s “love for dramatic speech and action” stemmed not from swaggering braggadocio, but from the depths of a “born leader.” The debt would never be paid until Best made some money, and the boiler was useless unless filled with steaming malt and hops. It’s not clear how Phillip transported his treasure the half mile or so from Langworthy’s shop to the family’s brewhouse. Perhaps his new friend provided delivery. Perhaps Phillip persuaded an idling wagoner to haul the vat with the promise of free beer. Perhaps one or more of his three brothers accompanied him, and they and their burden staggered through Kilbourntown—the German west side of Milwaukee—and up the Chestnut Street hill. But eventually the vat made its way to the Bests’ property—the location of Best and Company, and the foundation of their American adventure. OVER THE NEXT FEW YEARS, Phillip Best would lay the groundwork for what stood, fifty years later, as the largest brewery in the world. But in 1844, he was just one anonymous drop in a stream of humanity that poured into the United States in the mid-nineteenth century. A mere 600,000 immigrants landed during the 1830s, but starting in 1840, that trickle swelled like a creek in early spring: 1.7 million in the 1840s and another 2.6 million the following decade. Seventy-five percent were Irish and German (the rest hailed mostly from England and non-German northern Europe). Many of the Germans were cut from the same mold as the Bests: They arrived in possession of a bit of money and a craft that would earn them more. Most of the Irish, however, were impoverished peasants fleeing the famine that destroyed that sad island’s main source of food and, before it ended, killed a million people. The million or so who survived the trip across the Atlantic (many succumbed to the vomit, feces, and filth of steerage) were mostly peasants, uneducated, unskilled, and carrying nothing more than the clothes on their backs. The Bests had emigrated from a village called Mettenheim, where a Marley-like chain of war and poverty, taxes and regulations, shackled their ambitions. In the early 1800s, warfare and political turmoil left German-speaking Europeans, whether Prussian, Bavarian, Rhenish, or Austrian, exhausted, disabled, or angry. Explosive population growth and bad harvests added deprivation and poverty to the mix. Tyrannical princes and dukes suppressed political expression and individual ambition. Phillip and his countrymen yearned for a “true” Germany, a people united under one government that granted its citizens basic freedoms. No one believed it would happen anytime soon. The chain’s grip tightened in the 1830s, when the price of coffee and tea plummeted, and customers abandoned beer for the intoxicating novelty of caffeine. Others embraced potato-based schnaps, a throat-burning, alcoholic jolt that was cheaper than beer. Hundreds of brewers emptied their vats, damped their fires, and shut their doors. Copyright © 2006 by Maureen Ogle.